Shorty Jangala Robinson's paintings tell of his ancestors, the Jangala men, who were rainmakers. They are titled Ngapa Jukurrpa (Water Dreaming) and are centred at the extremely remote (to us) areas of Puyurru and Pirlinyarnu (Mount Farewell) over 160 kms to the west of the Yuendumu community, which itself is 300 kms north west of Alice Springs in Australia's Northern Territory. This part of Australia is frequently dry and the Aboriginal people had to find their water in soakages (a kind of natural water storage place or well) beneath the seemingly dry creek beds. Back in the dreamtime, two Jangala men 'sang down the rain' and the skies responded with an enormous storm. The storm rapidly travelled over the land, bellowing thunder and striking the earth with lightning, and the land was soon running with water. A bit like the movie 'The Perfect Storm', this weather pattern joined with another one approaching from the West, from Wapurtali, and became even more formidable. A Kirrkarlanji (brown falcon) caught the storm and carried it further to the west, dropping it at a place called Purlungyana, there creating a huge body of water which later became a giant soakage. The falcon (perhaps tiring after its efforts) then dug up the Rainbow Serpent, a giant Warnayarra (snake), which helped in carrying water to create Jillyiumpa, another large lake. Stories such as this are handed down through the generations. 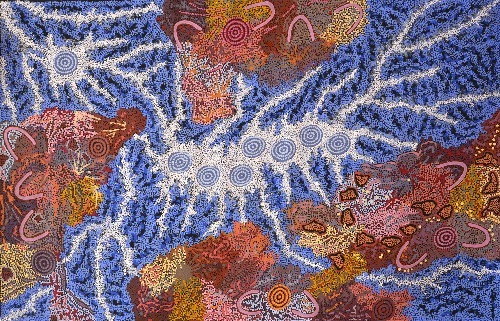 This is a Walpiri Jukurrpa (story), is painted in many forms by Shorty Jangala Robinson. The Jukurrpa belongs to Jangala/Jampitjinpa men, and Nangala/Nampitjinpa women (they are the Kirda (custodians) of the story) and is told through the use of traditional iconography. 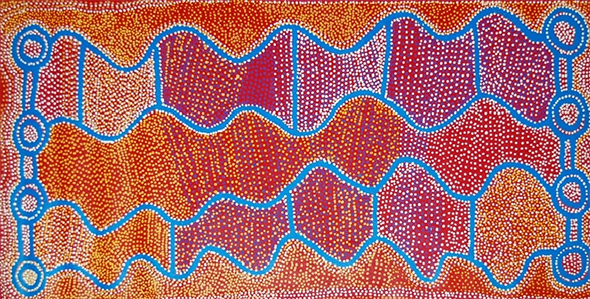 The paintings show the different areas where the story took place, and they contain the icons, or traditional Aboriginal symbolic marks, that represent the elements of the story. For example, the short straight lines in Shorty's paintings represent both stratocumulus and cumulus Mangkurdu (rain clouds). The long lines, both curving and straight, show the flow of the flood waters across the land. The concentric circles, large or small, show waterholes, Mulji (soakages) and Maliri (lakes) created by the storm. The combination of dots and lines represents the rain storms.